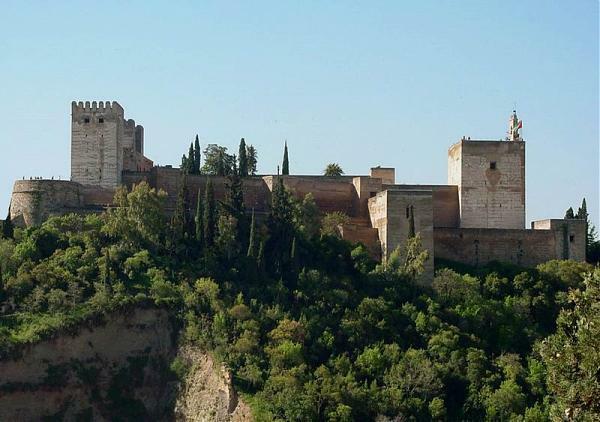 The Alhambra the complete Arabic form of which was Calat Alhamra, is a palace and fortress complex located in Granada, Andalusia, Spain. 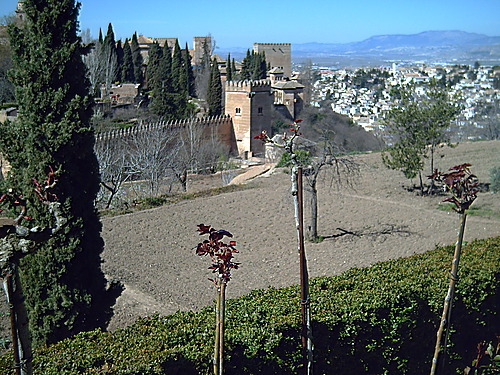 It was originally constructed as a small fortress in AD 889 on the remains of Roman fortifications and then largely ignored until its ruins were renovated and rebuilt in the mid-13th century by the Moorish emir Mohammed ben Al-Ahmar of the Emirate of Granada, who built its current palace and walls. 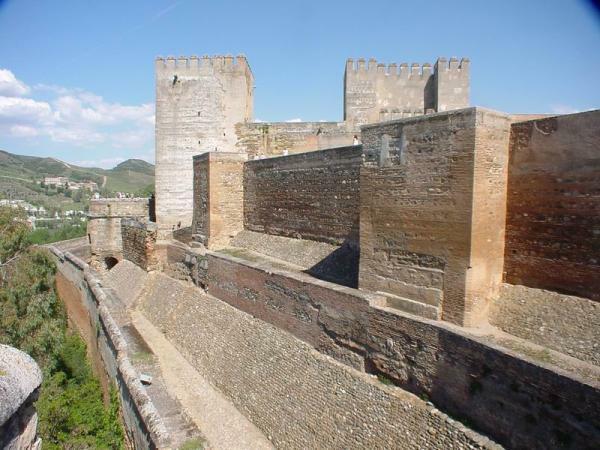 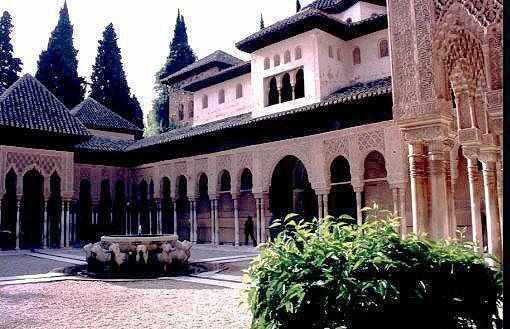 It was converted into a royal palace in 1333 by Yusuf I, Sultan of Granada. 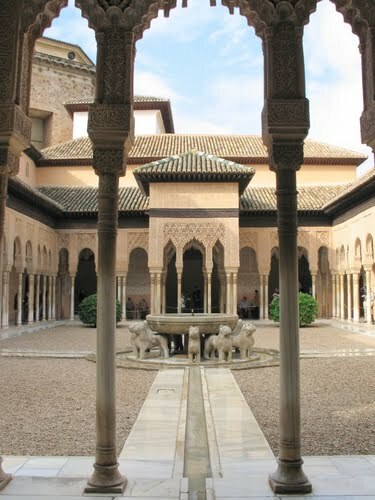 After the conclusion of the Christian Reconquista in 1492, the site became the Royal Court of Ferdinand and Isabella (where Christopher Columbus received royal endorsement for his expedition) and the palaces were partially altered to Renaissance tastes. 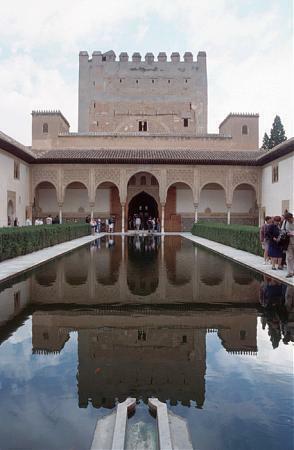 In 1526 Charles I & V commissioned a new Renaissance palace better befitting of the Holy Roman Emperor in the revolutionary Mannerist style influenced by Humanist philosophy in direct juxtaposition with the Nasrid Andalusian architecture, but which was ultimately never completed due to Morisco rebellions in Granada. 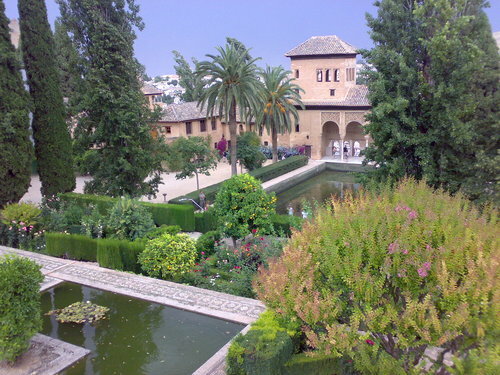 Alhambra's late flowering of Islamic palaces were built for the last Muslim emirs in Spain during the decline of the Nasrid dynasty who were increasingly subject to the Christian Kings of Castile. 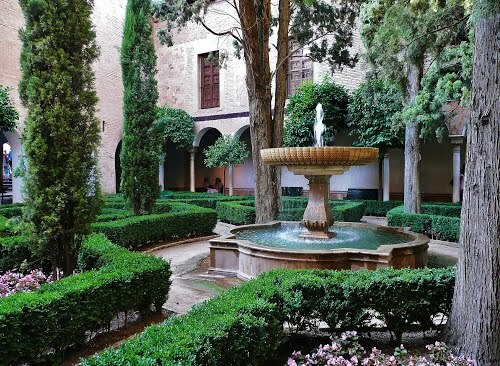 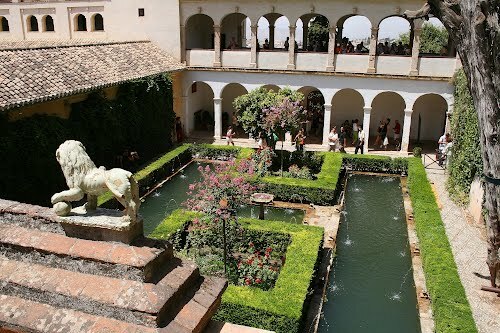 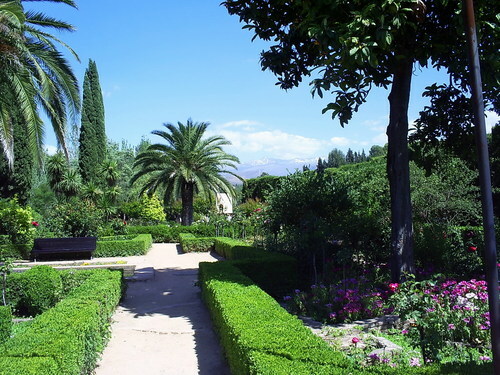 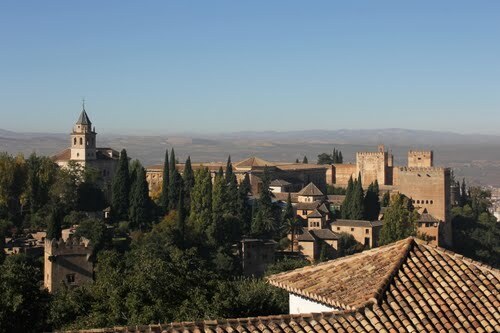 After being allowed to fall into disrepair for centuries, the buildings occupied by squatters, Alhambra was rediscovered following the defeat of Napoleon, who had conducted retaliatory destruction of the site, first by British intellectuals and then by other north European Romantic travelers. 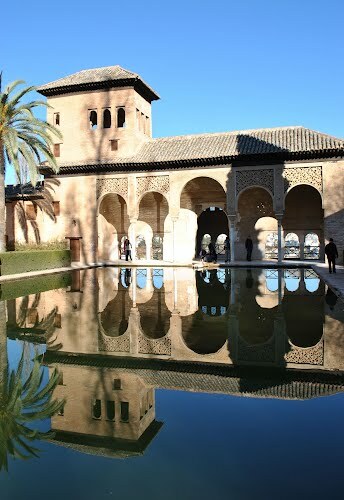 It is now one of Spain's major tourist attractions, exhibiting the country's most significant and well known Islamic architecture, together with 16th-century and later Christian building and garden interventions. 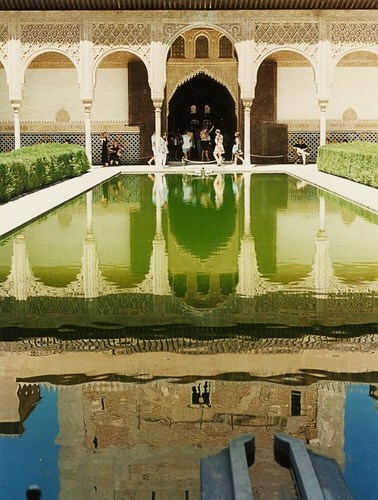 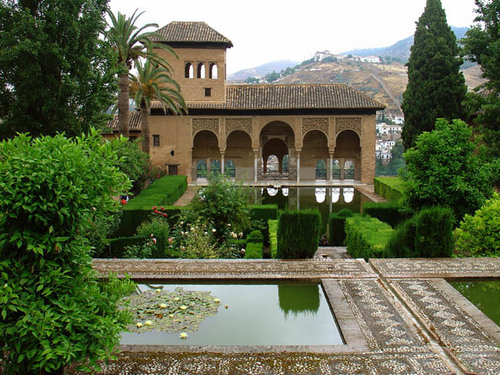 The Alhambra is a UNESCO World Heritage Site and the inspiration for many songs and stories. 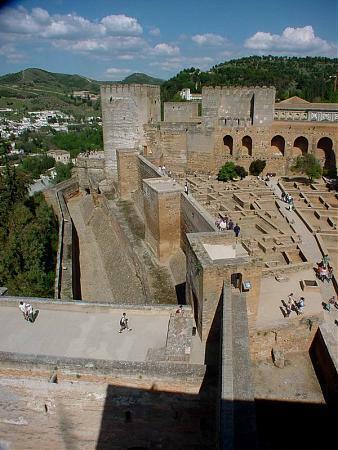 The palace complex was designed with the mountainous site in mind and many forms of technology were considered. 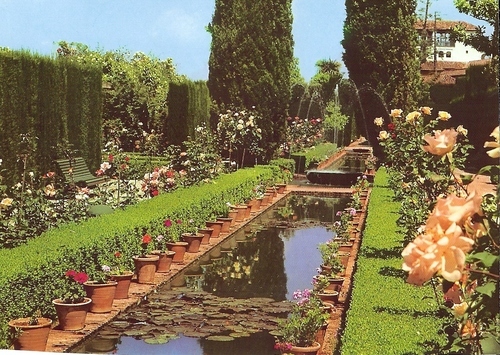 The park, which is overgrown with wildflowers and grass in the spring, was planted by the Moors with roses, oranges, and myrtles; its most characteristic feature, however, is the dense wood of English elms brought by the Duke of Wellington in 1812. 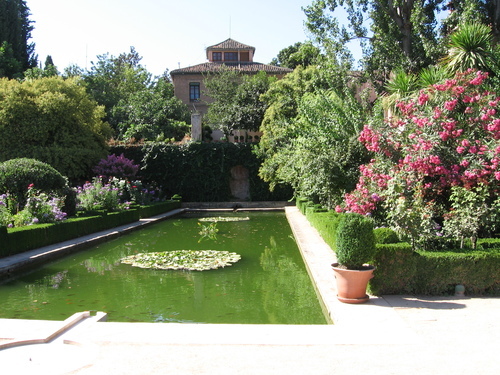 The park has a multitude of nightingales and is usually filled with the sound of running water from several fountains and cascades. 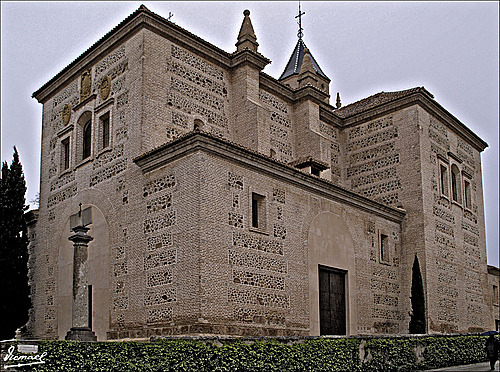 These are supplied through a conduit 8 km long, which is connected with the Darro at the monastery of Jesus del Valle above Granada. 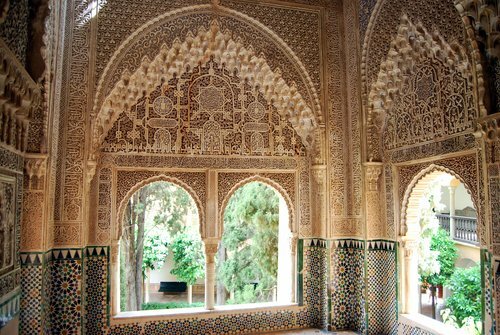 The decoration consists, as a rule, of Arabic inscriptions that are manipulated into geometrical patterns set onto an arabesque setting. 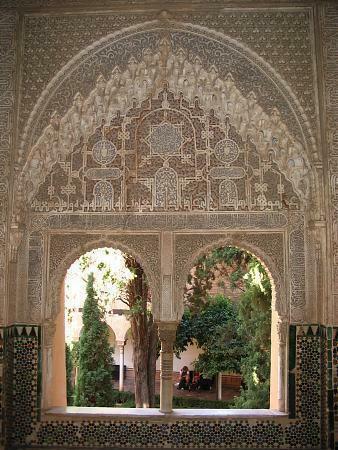 Painted tiles are largely used as panelling for the walls. 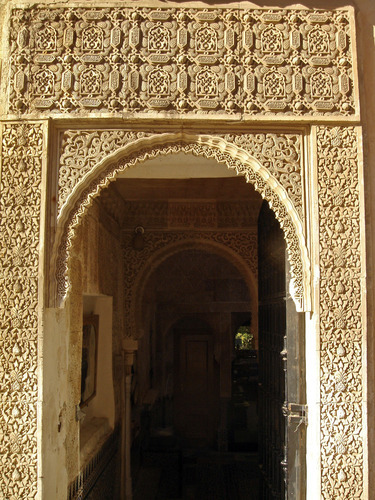 Much of the architectural ornament is carved stucco (plaster) rather than stone. 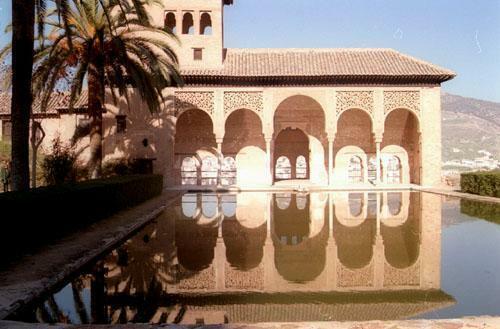 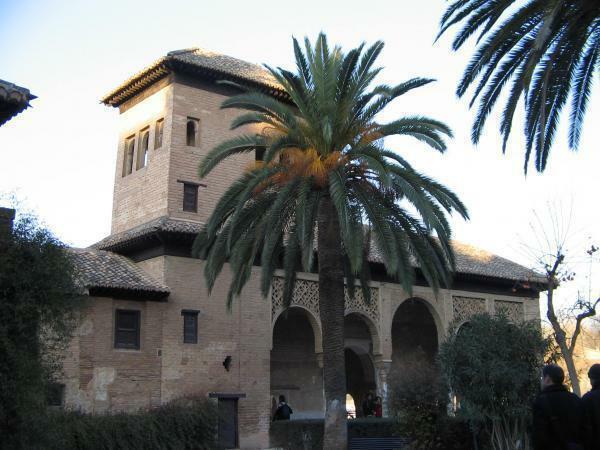 The palace complex is designed in the Mudéjar style, which is characteristic of western elements reinterpreted into Islamic forms and widely popular during the Reconquista, the reconquest of the Iberian Peninsula from the Muslims by the Christian kingdoms.